A Bird has been toying with us. By releasing a single at a time, the band creates more and more anticipation for a full set of songs. Their latest is ‘The Sun and the Moon’ which is a peek into the band’s more synthy-80’s side. 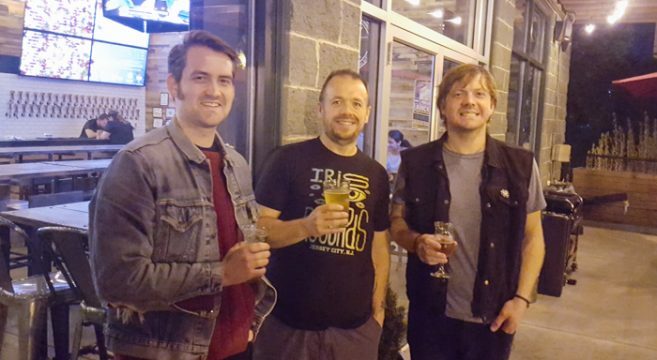 This is a new sound for lead singer and guitarist, Adam Bird, whose former band Those Mockingbirds was a more straight ahead rock band. I love it. 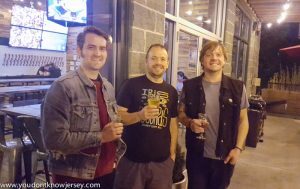 To celebrate National Pizza Month we caught up with Adam and Nick Ivory from the band at Plank Pizza in Saddle Brook for pizza and conversation. One thing that can be said for these guys is that they will always have something to talk about. We could talk and talk for hours and still just scratch the surface of some topics. 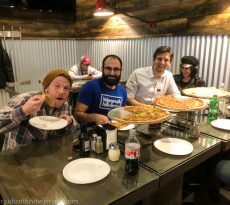 And, they know good pizza when they have it because they picked a stellar place to have Pizza with the Band this time out. 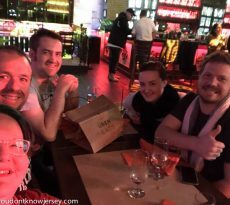 Plank Pizza Company Beer Parlor has amazing pizzas and appetizers, and a mind-blowing beer list—many from breweries right here in New Jersey. We tried four different pies but first we had the Loaded Potato Egg Roll appetizer which was like a deep fried pierogi. 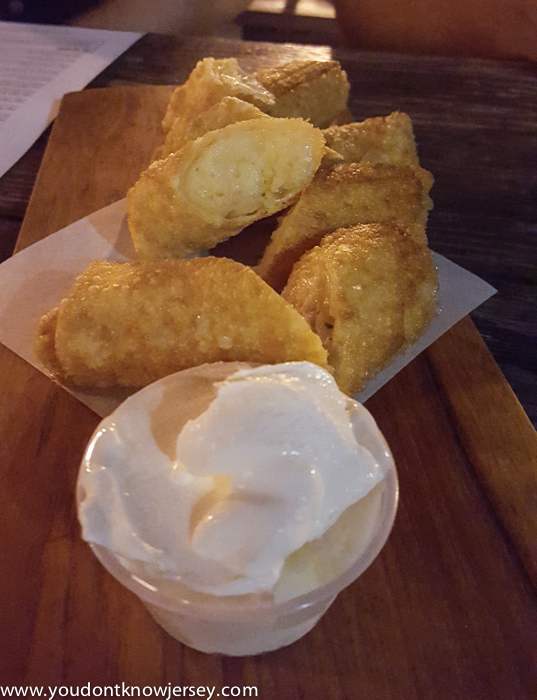 Lots of potato with a little cheese and bacon all surrounded by crisp wonton skin. Delicious and came with enough pieces to really share with everybody. While we waited for the pizzas to come out, we started ordering drinks and talking about the A Bird singles and a mysterious video that will come out shortly for ‘The Sun and the Moon.’ They wouldn’t divulge what was in this video but they certainly made it sound intriguing. Also intriguing was Nick’s confession that his early musical tastes leaned toward prog rock and especially the Peter Gabriel-era Genesis. Ed thought it would be interesting for Nick to play a show in full Gabriel make-up and elaborate costume. We will have to see if this becomes a reality. Adam’s oft-mentioned disdain of The Doors was something that we couldn’t ignore discussing, either. Ed and I happen to be fans of the band so we really needed to get to the bottom of this. Adam explained that the problem was really just Jim Morrison basically. The overrated mythos of the Lizard King was the root of his problem with the band. He admitted keyboardist Ray Manzarek was awesome so there is something redeeming about The Doors for him. Once the pizzas arrived at the table, all talk immediately turned to the pies. 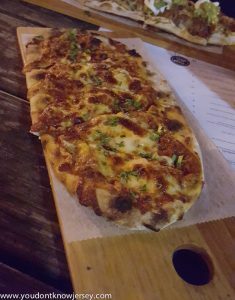 We each ordered a pizza we wanted to try and then we played pizza roulette by passing the small pies around the table to get a slice of each. I ordered the classic Red pizza which came with a really delicious garlic and Parmesan tomato sauce and mozzarella. It was my favorite of the night even with the fancier flavors on the other pizzas. This is no ordinary pizza place and their Red pie was just the beginning. 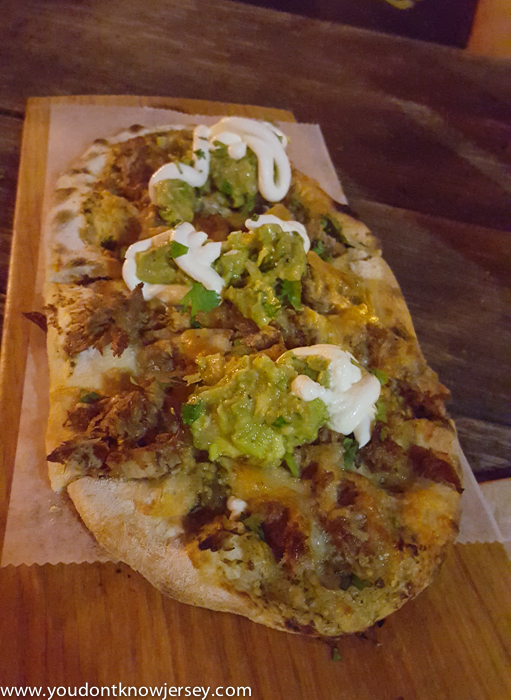 Ed got the Las Carnitas pizza with beer-braised pulled pork, tomatillo sauce, Jack cheese, guacamole and sour cream. The pulled pork was phenomenal. I thought the tomatillo sauce got lost in all the other strong flavors but it was still a very good take on Mexican flavors in pizza form. Nick went with the Artichoke pie which had garlic artichoke cream sauce, artichoke hearts and mozzarella. He felt we should have something with vegetables and he was right. We did need a lighter taste among all the other big flavors and this was just the right palette cleanser. 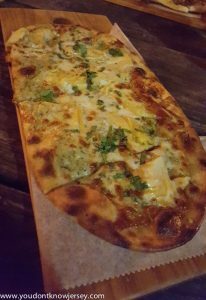 Adam went with one of his favorites, the Bacon Clam pizza. 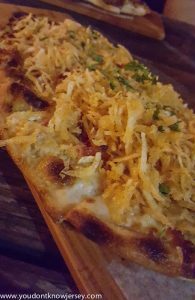 It had alfredo sauce, chopped clams, bacon, mozzarella and was topped with crispy shredded potatoes. Wow, what a combination. The balance of salty bacon, briny clams and creamy sauce was perfect. We could tell why it was his favorite among all the great options on the menu. Shortly after we finished the pizza, Adam’s wife and bandmate Emily joined us for a bit. She had just finished rehearsal for the night of upcoming musical, Catch Me If You Can, opening October 20th at the Old Library Theater in Fair Lawn. She reminded us that Adam’s mom makes a famously good pizza that even she still hasn’t been able to try yet. We definitely will be making a trip to her house for more Pizza With the Band soon. 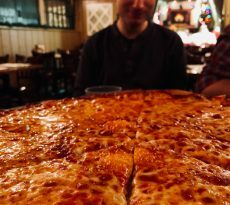 Mama Bird’s pizza, Adam assured us, is the stuff of legend. Speaking of Adam’s mom, Emily also told us that Adam had never eaten a peanut butter and jelly sandwich until adulthood. We’ll definitely have to ask his mom how she managed to raise such a fine boy without the classic PB&J sandwich. A Bird will be playing quite a few shows soon. 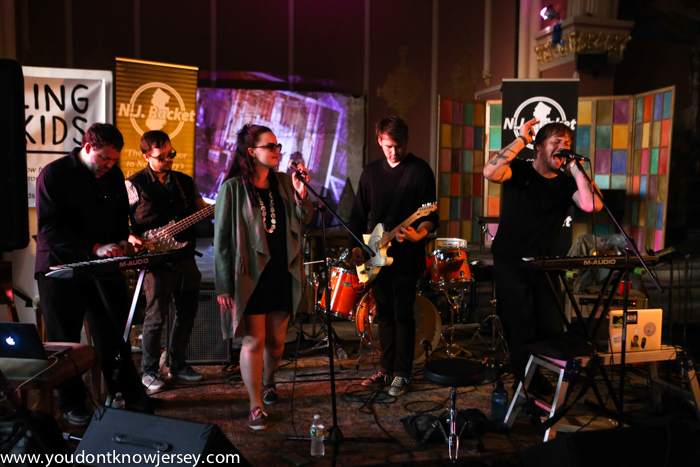 Go check them out and we think you’ll agree that the most inspiring music comes from bands who are willing to experiment with their sound and A Bird is taking Adam and the band in an exciting direction. It’s a bold new step in their music and we’re looking forward to hearing more. This Friday, October 13th, they’re at Stoshs in Fair Lawn. October 21st, they play John & Peters in New Hope, PA. October 24th they are at the Pet Shop, Jersey City. And, October 28th they’ll be at Hansils in Oakland, NJ.